Five states of the Federation on Wednesday night received awards for been top five reformed states in the year 2018. The states in descending order included Kaduna, Enugu, Lagos, Abia, and Anambra. They received their awards from Vice President Yemi Osinbajo at the Presidential Enabling Business Environment Council (PEBEC) Awards 2019 held at the old Banquet Hall of the State House, Abuja. Anambra State improved its score from 47 to 53.50 by making it easier to start a business and to register property in the State. – Abia State improved its score from 46 to 53.90 by making it easier to start a business and to register property in the State. – Lagos State improved its score from 48 to 54.90 by making it easier to start a business, register property and obtain construction permits in the State. – Enugu State improved its score from 47 to 56.82 by making it easier to start a business, register property as well as enforce contracts in the State. – Kaduna State improved its score from 55 to 65.97 by making it easier to start a business. Other companies and individuals that got awards at the ceremony included Oil and Gas Free Zone Authority, Corporate Affairs Commission, National Office for Technology Acquisition and Promotion. Omotayo Omoniyi, who returned large sum of money found to the authorities also received award at the ceremony. Other awardees are FIRS, Nigeria Custom Service, Nigeria Port’s Authority, Nigeria Shippers Council, Nigeria Electricity Regulatory Commission, Lagos State Judiciary. Banwo and Ighodalo, KPMG Nigeria, Procter and Gamble Nigeria, Deloitte Nigeria and Aluko and Oyebode also got awards at the ceremony. 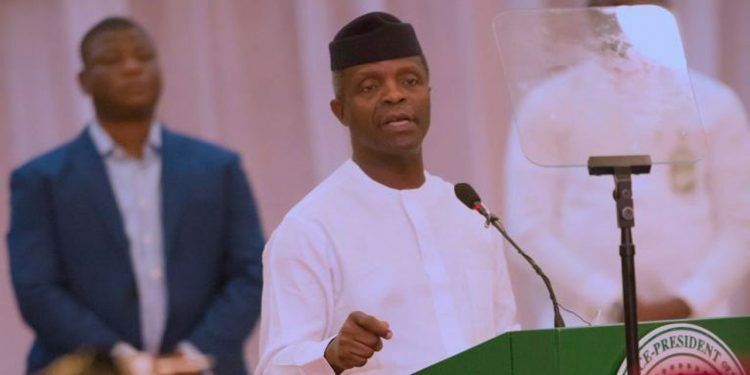 Osinbajo said “It really is a pleasure to be here this evening to celebrate the phenomenal successes of the PEBEC reforms but more importantly to recognize specially some of those who made it all possible. Our incredibly selfless and committed private sector partners and the sterling performance of many in the public sector.I n the past three years, Nigeria has implemented more than 140 reforms to make doing business in Nigeria easier. Stressing that PEBEC has now commenced the fourth 60-day National Action Plan (NAP 4.0) on Ease of Doing Business, he said, NAP 4.0 is running from the 1st of March to the 29th of April, 2019. “It aims to deepen the reforms delivered over the past 3 years and drive institutionalization. The Council, he said, will continue to work extensively with all MDAs, the National Assembly and other key stakeholders. He said “All of us who have been involved in this incredible journey will agree that it has been both exciting and fulfilling even if admittedly sometimes frustrating. But that is the way of progress. I congratulate you all for the great successes and thank you all for keeping faith with our joint vision. In particular we must commend our private sector partners who have contributed immensely to the technical output of the EBES through the secondment of professional staff to the secretariat. Let me specially mention the KPMG Professional Services, Deloitte, Procter and Gamble, Banwo&Ighodalo, Aluko and Oyebode. “The NBA-SBL was also particularly instrumental in the drafting of the omnibus bill. About 40 law firms worked pro-bono towards this effort. Our nation is truly grateful to you. “We must also commend the Hon. Minister of Industry Trade and Investment Dr OkeyEnelamah for his focused and forthright leadership, and the incomparable and tireless Senior Special Assistant to the President on Industry Trade and Investment Dr JumokeOduwole and her team. “To the rest of us I think we have demonstrated that the work of creating a world-class environment for commerce will be done by like minds in the Nigerian private and public sectors, and these are the exceptional ladies and gentleman such as yourselves who form the PEBEC family, well-done everyone God bless you.” he stated.